Hearing Loop: Helping Congregations Hear Sunday Sermon – Deaf and Hard of Hearing Services Center, Inc.
Holy Comforter Catholic Church in Charlottesville installed a hearing loop system less than a year ago. Reverend Dennis McAuliffe said a large portion of its congregation includes senior citizens. He said often times those with hearing loss couldn’t follow along with mass. Understanding the Sunday sermon is getting easier for the hearing impaired as more and more churches are installing hearing loops. Hearing loops allow people with hearing aids and cochlear implants to receive sound from a microphone. It’s like having words and music transmitted directly into the ear wirelessly. “They’re now included rather than just sitting there you know, numb because they can’t hear that well,” Rev. McAuliffe said. Jim Morrisard is a Holy Comforter parishioner and wears hearing aids in both ears. With the loop system he can now sit in the back row and clearly follow along with mass. Before the hearing loop he said that was hard to do. “It’s very annoying. In other words, you start a sentence and you say the world is flat and I understand it as the world is round from that kind of stand point. You only catch half the conversation,” Morrisard said. He said using the hearing loop is easy. There’s a switch on his hearing aid that he activates to tap into the loop system. It cost Holy Comforter under $4,000 to install the system. 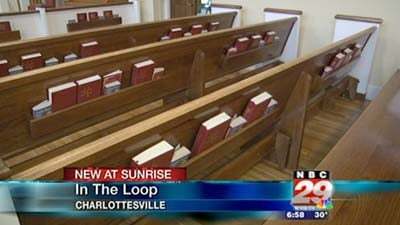 First United Methodist Church in Charlottesville recently renovated its sanctuary and it now includes a hearing loop. The Hearing Loss Association of America in Charlottesville meets the first Wednesday of each month (except in the summer) at 1 p.m. at the Senior Center on Greenbrier Drive. It’s an opportunity for the community to learn more about the technology that’s out there to help people hear well. – Thanks to PL, HLACVA and NBC WVIR-TV 29, Jan. 10, 2012, http://www.nbc29.com/story/16486106/hearing-loop.